133:2.1 While tarrying at the ship landing, waiting for the boat to unload cargo, the travelers observed a man mistreating his wife. As was his custom, Jesus intervened in behalf of the person subjected to attack. He stepped up behind the irate husband and, tapping him gently on the shoulder, said: "My friend, may I speak with you in private for a moment?" The angry man was nonplused by such an approach and, after a moment of embarrassing hesitation, stammered out-"Er-why-yes, what do you want with me?" 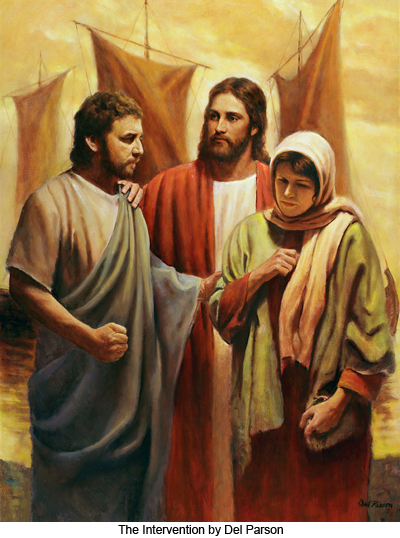 When Jesus had led him to one side, he said: "My friend, I perceive that something terrible must have happened to you; I very much desire that you tell me what could happen to such a strong man to lead him to attack his wife, the mother of his children, and that right out here before all eyes. I am sure you must feel that you have some good reason for this assault. What did the woman do to deserve such treatment from her husband? As I look upon you, I think I discern in your face the love of justice if not the desire to show mercy. I venture to say that, if you found me out by the wayside, attacked by robbers, you would unhesitatingly rush to my rescue. I dare say you have done many such brave things in the course of your life. Now, my friend, tell me what is the matter? Did the woman do something wrong, or did you foolishly lose your head and thoughtlessly assault her?" It was not so much what he said that touched this man's heart as the kindly look and the sympathetic smile which Jesus bestowed upon him at the conclusion of his remarks. Said the man: "I perceive you are a priest of the Cynics, and I am thankful you restrained me. My wife has done no great wrong; she is a good woman, but she irritates me by the manner in which she picks on me in public, and I lose my temper. I am sorry for my lack of self-control, and I promise to try to live up to my former pledge to one of your brothers who taught me the better way many years ago. I promise you." 133:2.2 And then, in bidding him farewell, Jesus said: "My brother, always remember that man has no rightful authority over woman unless the woman has willingly and voluntarily given him such authority. Your wife has engaged to go through life with you, to help you fight its battles, and to assume the far greater share of the burden of bearing and rearing your children; and in return for this special service it is only fair that she receive from you that special protection which man can give to woman as the partner who must carry, bear, and nurture the children. The loving care and consideration which a man is willing to bestow upon his wife and their children are the measure of that man's attainment of the higher levels of creative and spiritual self-consciousness. Do you not know that men and women are partners with God in that they co-operate to create beings who grow up to possess themselves of the potential of immortal souls ? The Father in heaven treats the Spirit Mother of the children of the universe as one equal to himself. It is Godlike to share your life and all that relates thereto on equal terms with the mother partner who so fully shares with you that divine experience of reproducing yourselves in the lives of your children. If you can only love your children as God loves you, you will love and cherish your wife as the Father in heaven honors and exalts the Infinite Spirit, the mother of all the spirit children of a vast universe."